What an incredible first week it has been at Shepherd of the Hills! I have eaten more good BBQ and drunk more Topo Chico than a human being should be allowed to have. This is the most welcoming, loving congregation--I am so blessed to be your pastor! My boys, poor rascals, had to go to brand new schools for the last two weeks before Christmas break, and are discovering that their new schools are pretty dang awesome. As I was walking home with my little guy the other day, we crossed over a creek, explored the woods to take a gander at a cactus, and he said, "Texas is the most beautiful place, Dad." Somehow we have managed to get our house all moved into, our Christmas decorations up, landscaping done---AND my parents just moved their stuff in this weekend, too. In the midst of all of that chaos and craziness, my wife turned to me the other morning and said--"I can't remember when I've been this happy." Even my cats are loving Texas. My psychotic cat has not only calmed down, she is more affectionate and friendly than she's ever been. And I am having the MOST fun getting to know everyone, hanging with the staff, and continuing to be welcomed to this incredible community. It should be illegal to have this much fun at work. I do need to preach today--so let's get down to it. 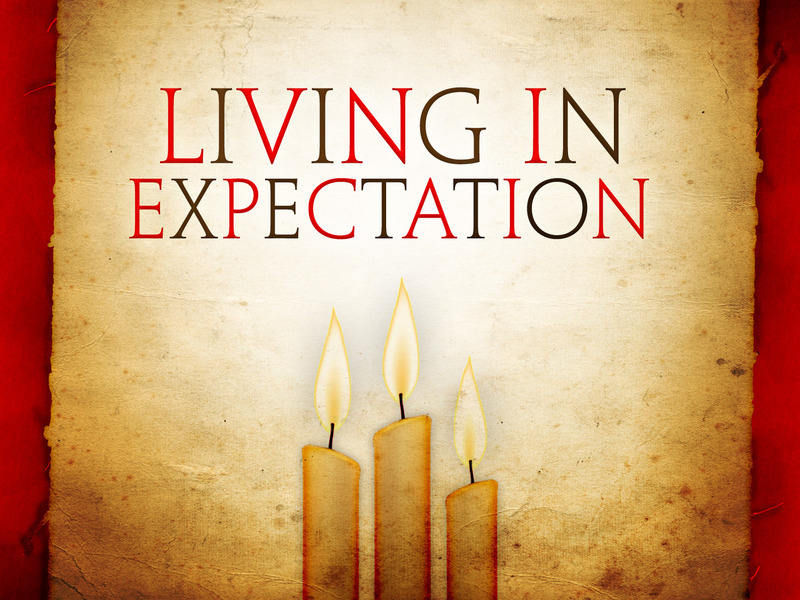 Today I am going to be continuing the sermon series that I started last Sunday--a sermon series entitled, "Living In Expectation." This is the Third Sunday of the season of Advent, which is a decidedly expectant season. As we mentioned last week, this is a timely sermon series for us because we are living in a very anxious, and uncertain culture. It's time we had a good word to help us carry some hope into the world around us. But in order for us to carry that good word of hope into the world, we need to start living in expectation of Jesus--even in the midst of uncertainty. 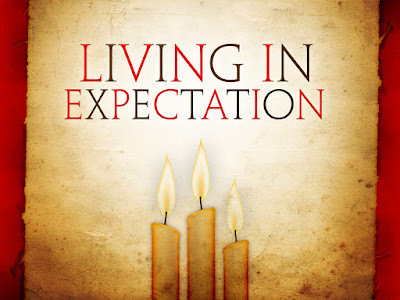 We learned last week that living in expectation of Jesus leads to joy. And this week we are going to be exploring the idea that living in expectation of Jesus leads to lasting peace. I want to share with you a bit of the story of how we got here to Austin. It was clear that God had called my family to move some months ago. I think we all knew it about the same time, but it was tough to put our arms around. When you contemplate the kind of move that we just made, you better enter into it with eyes wide open. What I longed for most of all was to feel a real sense of peace about where God wanted us to go. I had some sleepless nights, and a lot of ink was spilled in my journal as I prayed fervently over the decision that I knew we had to make. My heart was being drawn here to Austin, but I wanted peace. I wanted to have the peace that passed understanding, peace like a river, all I was saying was give peace a chance, are you feeling me? So we were traveling in England a few months ago with our dear friends from Chicago who were here last week for our first Sunday. I need to share with you the sequence of events for this story so you can feel the full impact. A few weeks earlier, my friend is getting dressed in his gym and another gym member overheard him say something to someone else about the fact that he was going to England. So this other member mentions to him that if he is going to England he needs to go to this small town named Avebury to see some standing stones. Random moment. My friend files it away. While we are in England, my friend mentions this town and we discover that it's not far away from where we were staying. So we go to visit Avebury. While we are there, I go inside this small church to say a prayer or four about how I need some peace. It was a tiny church, and it was empty. But the candles were still burning, and it was filled with the smell of must, stone, wooden pews, and incense. There was also an unmistakable presence in that place--the Spirit had filled it. Can I tell you that it was also one of the thin places of the world? You know what a thin place is, right? It's where the barrier between now and then, between here and eternity is just so paper thin you can almost see through it. The church had these plastic bins that were setup for travelers who might need some toiletries or a snack. There were vegetables from someone's garden set out with instructions to take the food if you were hungry. There were all these prayer stations where you could hang your prayer on a tree that had been planted in a bucket, and next to that tree was a glass jar filled with water. There was a sign near it that instructed you to take stone from the pile below and pray a prayer as you dropped it into the water. "Pray that God would take your burden and release you from it," the sign read. I took a stone and prayed--"God, I need some peace. Can you give me peace about this move. I don't have in peace. Please give me peace. Tell me where I am supposed to go and give me peace..."
And I dropped the stone into the water and watched it fall. I left the church and went outside--and Merideth and my oldest boy Jay walked in after me. They both felt the same feeling I had felt about the church. It was uncanny. After they walked around and prayed inside the church, my son decided on a whim as he was about to walk out that he would sign the guest book. As he wrote our name in the guest book, he glanced at the names of the people right above where he was writing, and where they were from. Okay... think with me about the events so far. My friend is in a gym and a guy overhears a conversation which prompts him to tell my friend to visit this little town. We just happen to be staying nearby said town, and decide as an afterthought to go and visit it. While we were there we all go inside this little church and feel the same feeling and I pray this prayer about God giving me peace. And then my son, who never, ever, ever signs guest books decides to sign the guest book. And discovers that the people who signed right above his signature had been there earlier the same day... and were from... can you guess where from? When I saw this with my own eyes, I went back through the book to find any other Americans who might have signed it. There weren't any for months. Except that day. The day we were there. My friend embraced me after this happened, and told me, "I am so happy for you man." I felt a sense of peace wash over me then--peace like I hadn't felt in so very long. It was a moment when I realized that all that stumbling after Jesus had led me to a life-changing intersection. And then it struck me--the peace I was looking for had been there all along, waiting for me to discover it, waiting for me to be amazed by it, right where I least expected it. We all have experienced moments like this--where you find yourself longing for peace and then you realize that everything you are longing for is often right in front of you, waiting for you to see it. If you remember nothing else that I say today, I want you to hold on to this: Living in Expectation of Jesus leads to lasting peace. In today's Scripture reading from Matthew chapter 11:2-11 we have a moment when John the Baptist is struggling to find peace about Jesus. He wants so desperately to believe that Jesus is the Messiah, that God really did answer his prayers, and that his entire purpose in life had not been for nothing. John the Baptist's question is the kind of question that so many of us ask when we are struggling to find peace in terrible circumstances. John had preached that the Messiah would come, but he now finds himself in prison--tossed there by Herod the Tetrarch, the son of Herod the Great. The Scripture indicates that John was thrown in prison for calling Herod out for divorcing his first wife and then marrying the wife of his decease half brother. John sits in prison expecting that something is going to happen soon--that the Messiah will arrive and set everything to right, including perhaps busting him out of the clink. His question is essentially this: "If you are the Messiah, if you are the Chosen One, if you are the Savior----why am I still in prison? Why hasn't the government been overthrown? What the heck is going on? Why is evil still getting one over on good?" John the Baptist was expecting something completely different. He longed for peace that would come on different terms. Instead, Jesus gives him a different vision for how the peace of God has come to earth. Jesus describes Shalom--signs and symbols of the world as it should be. The blind given sight, the lame walking, the diseased made whole, the deaf given hearing, the dead raised and the poor given hope. Shalom--the peace of God--brings this kind of healing to all of Creation. Essentially Jesus says to John, "Are you kidding me? You want peace? You want peace? OPEN YOUR EYES MAN! IT'S RIGHT HERE IN FRONT OF YOU!" And the kind of peace that Jesus proclaims is the peace that really does pass all understanding--the peace that doesn't make any sense. It's the kind of peace that flies in the face of anxiety and uncertainty--even when anxiety and uncertainty threaten to rule the day. Where in your life have you been searching, longing for peace? Have you been struggling with a difficult decision and can't seem to find the peace you need to make that decision? Maybe you are living with illness, chronic pain, or you are caring for someone who is. Maybe you are discovering a whole lot more month at the end of your money. Maybe you are struggling to look at yourself in the mirror without feeling shame and regret. You know what it's like to live without peace, and maybe you have had moments when you cried out to God like John the Baptist and shouted, "Why? If Jesus is really the Messiah, why don't I have peace? Why is the world so messed up? What are you doing? Are you even there?" "What do you see? Open your eyes, child. Look around you. The peace you seek is found in serving me with wild abandon. The peace you seek is found from finally surrendering the outcomes to all of these things that are holding your heart hostage. The peace you seek is right here in front of you in the eyes of the broken and the needy who need to know there's more to life. The peace you seek is in the thin places created when you worship me with all of your heart, soul, mind and strength. How would your life change right now if you just started living in expectation of Jesus--ready to discover Jesus in those unexpected places right in front of you? The truth is, those thin places I talked about earlier--they are everywhere--all around us. We just have to have eyes to see them and ears ready to hear the whispering of the Spirit and hearts ready to be transformed by the crazy, incredible, peace that passes understanding. Beloved. Living in expectation of Jesus leads to lasting peace. Let's live in expectation of that lasting peace, the shalom of God together.